“The ‘smokeback after 1 hour’ problem often comes with stagnation in the barrel. This can be due to air leaks into the barrel (usually shows up fairly soon) or poor insulation around the heat riser. 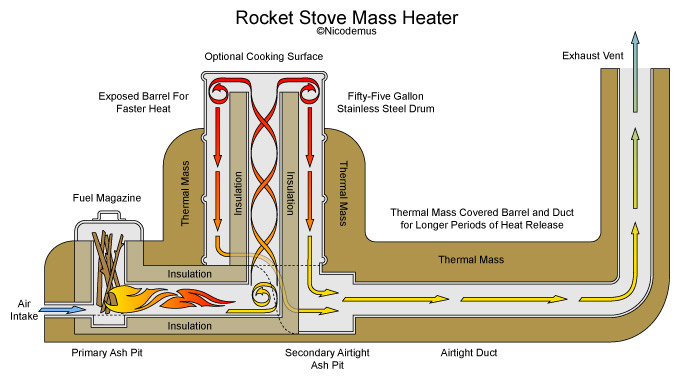 My guess is that when you added more material around the heat riser, you effectively increased the R-value. Clay and sand still isn’t a lot of insulation – you ideally want something like perlite, stabilized with clay if your heat riser is built around flimsy metal; or better, a masonry heat riser wrapped in a good insulation material like refractory blanket (rock wool – 1″ or more), perlite (2″), or vermiculite (4″ in an insulation container). When you get into materials like sawdust-clay or pumice, you’re looking at 6-9″ to achieve the same R-values as the thinner layers of better materials. The other problem is the question of the horizontal exhaust. Not sure what you mean by ‘vertically out the wall,’ but if you have a conventional roof with vents, you’re going to want a conventional chimney (that rises vertically, and remains warm until it reaches a meter or two above the ridge of your roof). If you have an unconventional roof e.g. rubber membrane, that’s hard to put a chimney vent through without leaks, at least bring the chimney as far up vertically within the house as possible before taking it through the wall. Going out sideways and then insulating your way up ends up being an expensive, difficult solution. 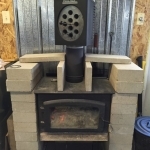 Insulated chimney is expensive, and heavy, and you’ll need brackets that may be more difficult to fit than the ceiling boxes that come with a through-roof kit. If your chimney is outdoors, vertical, and cold, you would see the biggest smokeback problems within about 20 minutes of startup. If your chimney is too short, you would see the biggest problems once your house gets warm (if the house draft is sucking air into the chimney), or with certain wind and weather conditions (wind blowing against the side of the house and pressurizing the chimney; or whipping around eaves into the chimney; or sometimes with certain height combinations you get weird effects on warm days, rainy days, etc). If you do need to ‘out compete’ house draft, do what you can to weather seal the UPPER HALF of the house, and open some air supply into the lower. (Insulate and seal the ceiling, not the roof, for preference). In general, any hole in the bottom half of the house will tend to act as an intake (negative house pressure), and holes up top act as outlet vents (positive house pressure). It’s easy to chase down all the cold incoming drafts along the floorboards and lower windoes, seal them up tight, and leave the big gaping warm holes in the ceiling and around the upstairs windows because you don’t feel any chill from them. Then the negative pressure builds up even more in the bottom half of the house; it’s like a drinking straw just gasping to pull some air through that new hole down low in the wall, no matter whether you call it an ‘exit chimney’! You could try the notches, but the p-channel should be 5% to 6% of the feed csa. Also, the metal plate will probably deform when heated up, that’s why my suggestion would be use folded sides in order to stabilize the plate. The width/depth proportions aren’t crucial to my knowledge. It’s just that 5% csa divided by the width of the feed. Oops, your plate is 1/4″, that’s a hefty piece of metal. Maybe you could get away with it, you have to try it yourself. When using a door, it’s best to have the p-channel covered as well. May I suggest you channel this through the door frame and use a separate slider or similar to close it off?